Think Mexican and breakfast at the same time and chances are you’ll think of breakfast burritos from a fast food joint. Don’t be too hard on yourself for that. A lot of people have been introduced to “Mexican” food by the likes of Taco Bell or those nasty little Jack in the Box 2-for-99¢ tacos I hate in concept, but love in my mouth. 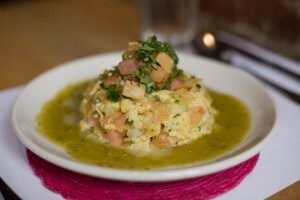 If you’re a bit more knowledgeable about Tex-Mex cuisine, you might think of Huevos Rancheros. And I’ll give you credit for that. Call it ten Manly Points. Not surprisingly, however, there are a lot of other things on the Mexican breakfast menu. 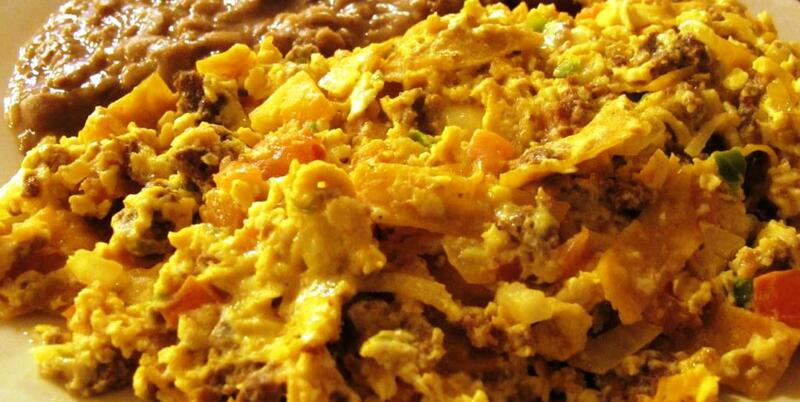 One of my favorites is Migas – meaning crumbs. Don’t get worried; it’s just a nickname. I’m not going to feed you counter sweepings, OK? I’m going to feed you a plate-full of some of my favorite things. 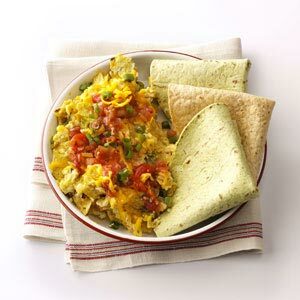 Basically, this recipe combines many of the things I love about Mexican food – tortillas, peppers, salsa – with scrambled eggs, another favorite of mine. I grew up on scrambled eggs, and I’m fairly certain I was born with jalapeno juice in my veins. I think my first diaper was probably a flour tortilla, but I could be wrong. Point is, this is a breakfast dish made just for me and people like me. Gather ’round the stove and I’ll show you how to make Migas. Remove eggs from fridge and let sit on counter to warm while you prepare everything else. Chop onion, and, if using, cilantro. Thinly slice green onions, if using. Cut tortillas into 1/2″ strips. I usually cut the tortilla in half, then cut strips from the halves. In a large bowl beat eggs and half and half with a whisk until thoroughly blended and a bit foamy. You’ve heard this from me before, but it bears repeating: beat ’em like they owe you money! Heat a large frying pan (the biggest one you have) over medium heat. Add tortilla strips, Flip them around so they all get some oil on them. They won’t be happy unless they’re covered in oil. Saute for three minutes. Add onions and jalapenos and saute for another two minutes. Add 1/2 cup salsa to pan and cook for just a minute to heat it up. Give eggs one last beating and add to pan. 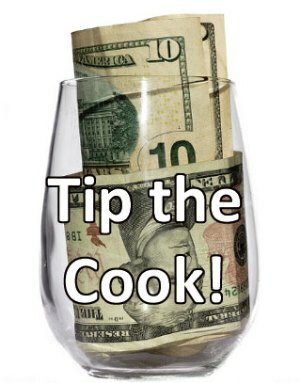 Let them sit for a medium ten count while you rinse the bowl, then start moving your spatula. Your hand should be on the move almost constantly, slipping the blade of your spatula under the eggs, moving around the pan, until most of the liquid has run underneath the cooked eggs. Continue to cook until eggs are soft set. Sprinkle shredded cheese (I prefer Mexican blend) over top of the eggs. Continue to cook until cheese melts. Spoon onto plates and sprinkle with green onions and/or cilantro. 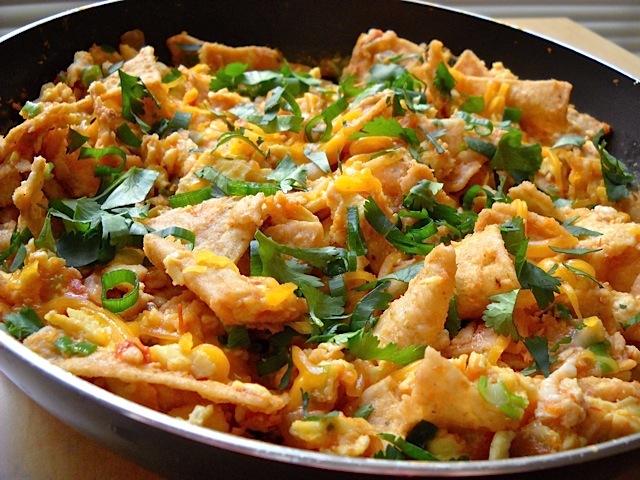 Serve immediately with warm tortillas or toast. Offer hot sauce, jalapenos and salsa on the side, along with more shredded cheese, and sour cream if you’re into it. The recipe doesn’t call for it, but I always add some half and half to my scrambled eggs, because it makes them creamier. And I use half and half because milk – especially 2% and the like – don’t have much to do with “creamier.” Feel free to leave it out altogether, if you choose. Another adaptation some may choose to incorporate is to leave out up to half of the egg yolks, using only the whites of some of the eggs. I am totally not into this, but I won’t deduct any Manly Points for it. Most recipes use red salsa, but you can certainly do a verde version using green salsa if you like. the choice of smooth or chunky salsa is a personal thing. One variation I’ve seen removes the tortilla strips once crisped a bit. The recipe is continued without them. When ready to serve, put some tortilla strips down as a “bed,” then put a scoop of egg mixture in the middle. Drizzle some salsa over the top. The last picture shows a version that doesn’t use tortillas at all. A great accompaniment, especially if you’re having it for brunch, lunch or dinner, is a stack of sliced tomatoes and avocados. You can also serve breakfast potatoes, beans (refried or whole) or rice. This is an excellent choice for a slow Saturday or Sunday. It’s really great if you’re planning on having Mexican food later, because it gets you in a South-of-the-Border mood. Check out more Breakfast Recipes here. 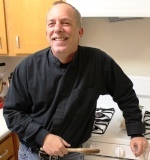 Then browse my Mexican Recipes.